I bet it was a marvelous day for all year levels of the high school on the 11th of March as it was our very first field trip of 2014! 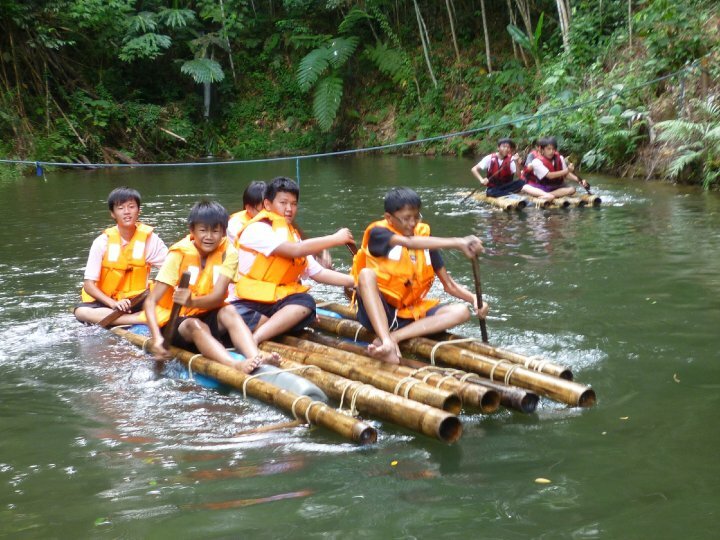 Each year level went for a different designated field trip and as for the Year 10’s, we went to Dusun Eco Resort, Pahang. The activities in store for us included a flying fox and an obstacle course – all to help train our confidence as well as face our fear of heights. After we boarded the bus, breakfast packs were distributed to us and we were off! The bus ride was long, yes, but nevertheless we had fun. Students were able to talk and interact with each other to make the ride less boring and dull. The trip to Pahang nearly took us 3 hours. There were many winding roads and sceneries that might or might not impress you. The resort was actually uphill, therefore the bus had to stay and we were all given a ride in a truck uphill. For some of us, it was amazing with the wind blowing in our faces; making us feel infinite but for some unfortunate ones, might have felt dizzy once we arrived at the top. We had to wait for the others to arrive before proceeding with the activities, which took nearly 30 minutes to an hour. Students were gathered by the teachers and each class had to choose at least two leaders to make sure the students were behaving properly. The instructor gave a quick introduction about the place and showed us how to wear the harness for the flying fox. We were to leave our bags in the office so we don’t have to carry it around. So the adventure began! We had to hike up for another 10 minutes to get to the flying fox but before we get onto the flying fox, we had to cross a bridge. There were no harness to support us, no helmets, nothing. Only around eight people were able to go at once so the line was quite long and there were bees and mosquitos! Some bees landed on our hands and heads but most of us did not mind, as long as they are harmless. So the bridge was like this, imagine three wires with gaps in between them and a wooden plank after every five feet and if we were to fall, the only that might or might not catch us was the net. Yes, a net. The only thing that kept us balance were two wires for us to hold and steady ourselves. It was quite high, around the second floor of our school and a road was beneath us and once in a while, the wind would blow and the whole bridge would seem like it is swaying. If you’re a person who is afraid of heights, you should really conquer your fear by crossing this bridge. Once we were on the other side, relief washed over us and we went to join the others. Now the fun part, flying fox! The flying fox was extremely long distanced and two students were allowed to ride at once. We all chatted excitedly whilst waiting for our turn with our partner. It was quite terrifying considering the fact that we were high above in a hill and we were dangling from a wire swinging like Tarzan to the other side where a woman waited for us but it is the most wonderful feeling. That was the closest we would get to feel what it is like to fly. We were beyond infinite. After students were done with the flying fox, we have to have a quick lunch consisting rice with three dishes. Students were expected to wash our own dishes after were done eating. Students were talking hastily with each other about their experience. Students were given at least an hour to rest and charge themselves for the next round of surprises. Students are then gathered for the next briefing and we were off to the obstacle course. We had to walk uphill again to reach the first obstacle which was climbing over a stone hard wall. Most of us made it by ourselves but some needed boosting from our friends. The second obstacles was the ‘spy laser’. Our hands must be behind our backs and we were to cross from this end to the other. The third obstacles was a tire. We had to pass it through the hole. Some of us got stuck in the hole instead of crossing over it. They were many laughs and giggles but we helped each other out because all these obstacles are based on team work. The fourth obstacle was a net wall which we had to climb up and back down with a partner. The climbing part seemed easy but wait until you reached the top, you will need a strategy to climb back down or you might fall. The five obstacle was a balancing test. You and your partner will rely on each other. Imagine two wires connected to two poles. One on the starting point, the other on the end and the wires will start closely together then slowly going apart, that’s the tricky part. Most of us gave up in the middle because it was so wobbly. We had to skip an obstacle which we have to crawl below the wires because the water was infested by gigantic tadpoles! So we went to the seventh obstacle, this is one of the hardest for the students. We had to go up to a platform, there were only two thick wires and we had to lie down and push our body to the other side. Our feet and hands had to push. By the time we reach the other platform, our handswere red. The next one was to cross over on a wire with ropes in between to balance ourselves. It was easy everyone got pass that fast. The next one was to walk on a wire with another wire above you (to hold) to balance yourself. The next one, you have to crawl. Imagine you are crawling on the inner part of the human ribcage but the bones can move. That’s how it was. The next one, which was another one of the hardest part of the course. There were six tire swings and we had to get over the other side crossing that, it looked easy but it’s extremely hard. You have to balance yourself on the swings. That nearly took forever for us to cross. Last but not least, we had to walk on logs, two in fact. There was nothing to keep the logs still except for the strings that they were placed on. But it was much easier compared to the tire swings. The students who were done with the obstacle courses are allowed to walk back to the chalets and rest while the others were still doing it. Before we knew it, teachers gathered us and we were placed on the truck and went back down hill to our awaiting buses which were ready to take us back to school.